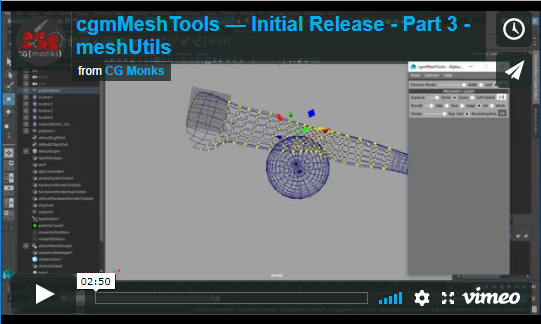 MeshTools are a collection of tools to work with geo (poly or nurbs(for some)). You can find a detailed breakdown on the sections in the links provided. Main modules this tool is using for those wanting to dig in. The math section is about using the positional data to do math functions similar to other deformers like blendshapes. 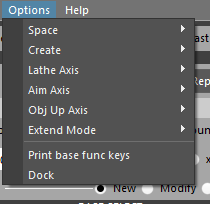 The space section of the options menu affects math functions. Various methods of selecting helpful bits on the base.. Same as before but on selected target geo. 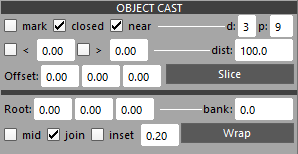 Functions cast on selected objects. Cumulative effect. Last object is treated as the base (except for copyTo). See previous section for more details. This was our intial pass on rayCasting with geo in a ui form. Load Field - Multi select ability enabled. 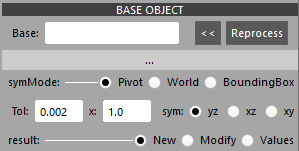 Displays loaded names and mesh types. Clear all - Clear this. When clear, ALL eligible targets will be used. For most things toolbox section is probably more intutive except for shapeCasting which it doesn't do. 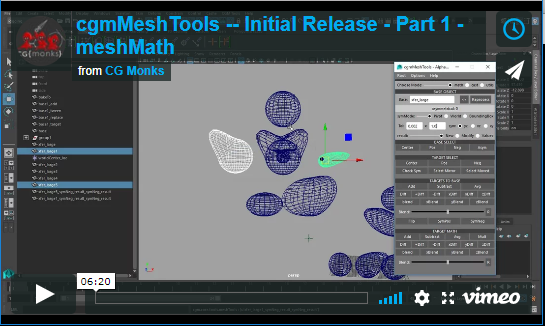 Create - (Options Menu) - What to create for click mesh when tool is released. This is a two part section. Most of the options in the slice section affect the wrap section as well. The general theory is that rays are cast from a given object in order to create curves. To my mind I think of the death blossom from the 80's flick the Last Starfighter spinning around around shooting rays. 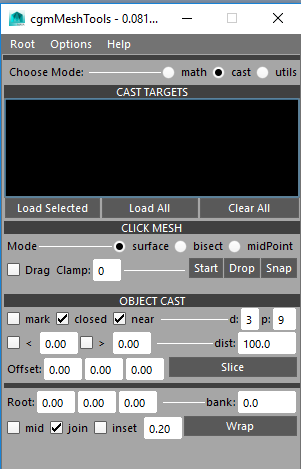 Works off a given selection of objects and uses the cast targets specified or all if none are. A slice is a single curve lathe. mark - Mark hits. Useful for troubleshooting and using data for other bits. d  - The degree of the curve to create. 1 is linear. A wrap is a more complicated lathe often with more than one cast point. Root: [0.0] [0.0] [0.0] - Root Offset - Offset for our root cast object. May be pulling this from gui call. bank: [0.0] - Bank - Bake for cast object. May be pulling this from gui call. 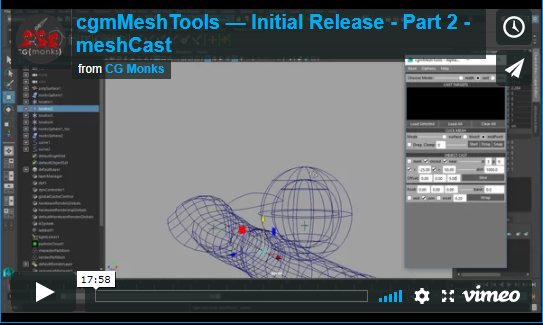 mid - Mid mesh cast. May be pulling this from gui call. join - Join cast curves. Only used in certain modes. Inset [ 0.2] - Inset multplier. Only used with certain modes. 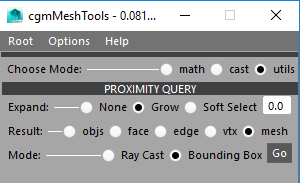 Create proxi geometry based on a from to selection. * Expand - Mode by which to expand the found selection. Result- What kind of data we want from our processing.